In modern dance, movement more often originates in which part of the body? Comments for In modern dance, movement more often originates in which part of the body? First of all, it is important to consider that the expression modern dance refers to a dancing trend that involves different 'styles' of modern dance. Each style has its own features and it would be wrong to state that they all originate movement in the same way. However, the torso and chest are both considered as initiators of movement in some famous modern styles like the one of Isadora Duncan. In contrast, Martha Graham, who is also considered as a very important figure of modern dance, taught to originate movement from the pelvis. And according to Ramiro Guerra's dance didactics, the Cuban modern dance technique should originate movement in the pelvis but in a constant opposition created by the torso. That variety of approaches lies not only in the 'techniques' themselves, but in the particular understanding that each dancer has of what the concepts of 'movement' or 'body' are. So, the answer to your question is not so simple. For example, the chest (or torso) can be understood as the place where feelings are born (and movement as a consequence of them) or it can be understood in anatomical terms. 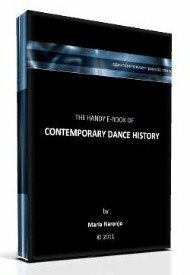 Those things make up the ideological background of each 'modern dance style' and vary a lot from one dancer to another. The good thing is that if you didn't know the answer, now you know a lot more than that! !